a fistful of phalli….a posy of violettes.. This is a good example of a gratuitous food shot: a waste of time and space,,,but quite funny. In a recent post I wrote disparagingly of white asparagus; those fat, firm, and pallid phalli which serve to testify that however much size may matter, it still may not taste very good. When I tapped out that particular tirade I had forgotten about their slightly more obscene pink tipped cousins, known as “violettes, a large bunch of which we received as a gift from good friends when they came to lunch at the weekend. These delicately coloured spears exude promise. They are like perfectly formed breasts; supremely desirable and unbearably tempting yet, in the end, so limiting in what can be done with them….such is the way with asparagus. Forget thoughts of covering them in cream or putting them in decoratively crimped pastry, for in that direction lies only disappointment. That which they do need is loving care. Hold each stem at both ends and gently bend it until it breaks, discarding the root end. The remaining stem must then be gently pared to remove the thick outer skin. I have an asparagus cooker which I never regret buying even though I rarely cook asparagus, although this may now change owing to my new found relationship with Violet. Put the basket of prepared asparagus into the asparagus cooker which has been filled with cold water to a level just below the tips of the spears. Cover and bring the water to the boil. The spears will be cooked in about 20 minutes, which seems a long time but in my experience it’s what they need. Serve them cold with a good mayonnaise or warm with a sauce made from crushed hard boiled egg yolks, salt, pepper and olive oil. The latter is fantastic and once tried will not be forgotten. Strawberries are very good as pudding and have the same sexual overtones that suit asparagus very well. 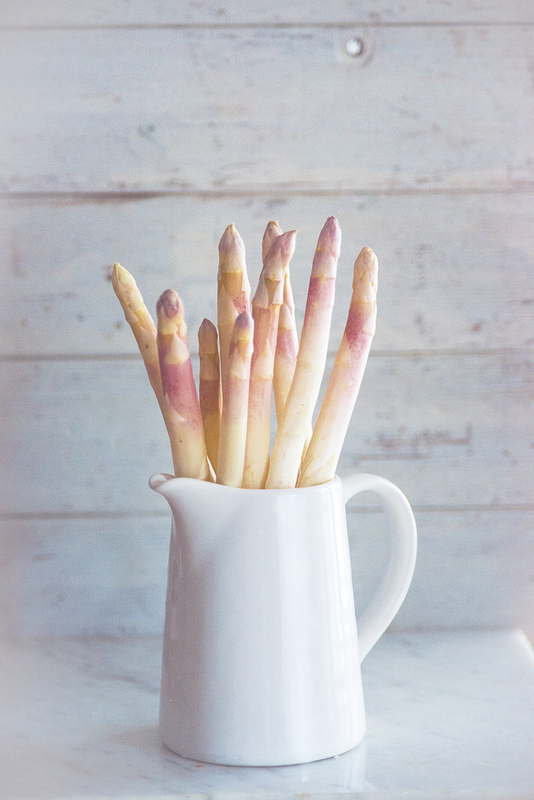 For some reason I thought that this beautifully pale asparagus would not cause the infamous asparagus pee…..I was wrong. This entry was posted in 2015, asparagus, Cooking, Cuisine bourgeoise, Digital photography, Eggs, food, Food and Photography, Food photographer, France, Fruit, Hard boiled eggs, Olive oil, Photography, sea salt, strawberries, summer, Uncategorized, Vegetables, Writing and tagged clear thinking, cooking, delicious confection, digital photography, food, Food photographer, France, Humour, Photography, writing. Bookmark the permalink. 35 Responses to a fistful of phalli….a posy of violettes..
Beautiful photos on this post – I absolutely adore them. I’m quite keen to try them, but I doubt I’ll see them here. None of your shots are ever a waste of time or space Roger…. 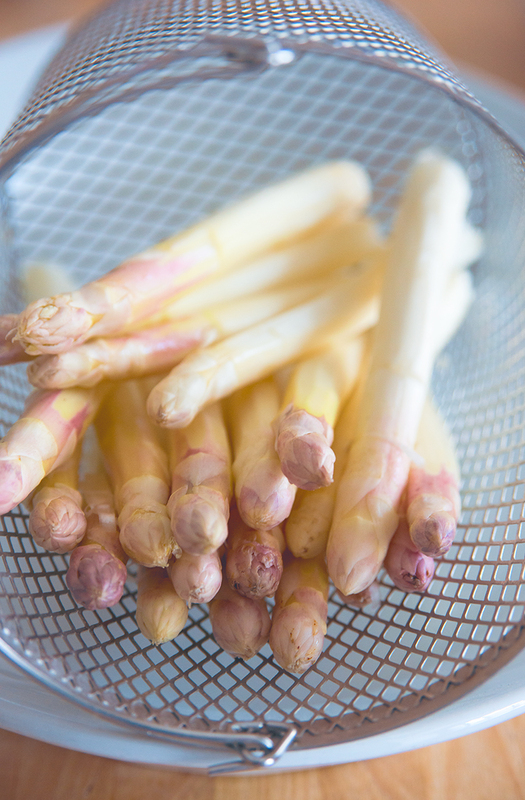 The crunch of the violettes is still more appealing to me than the huge white asparagus of German spring cooking, and I imagine they would be even more so with that sauce of yours, Roger. Asparagus pee is my friend. 🙂 I could eat asparagus every day. Hoho…your new affair with Violette! Seem to be odd [hardly new, Sarah Miles and I seem to come from the same brood !!?] but eat asparagus both. or should I say all, colours with no aromatic changes . . . actually have to say another ‘thank you’ for yet another journey to Mr Google . . . interesting and informative 🙂 !! Sarah Miles long remembered but not for the ruddy asparagus!!! Aye Milord!! . . . offbeat memories . . . sometimes having those extra years to carry is not all that bad . . . Beautifully obscene. Just gorgeous photography. Fantastic colors! I have never seen this type of asparagus, just the green, purple and white variety. The color is so delicate and absolutely alluring. Your stories always give me a chuckle and a bit of knowledge which is a great combo!